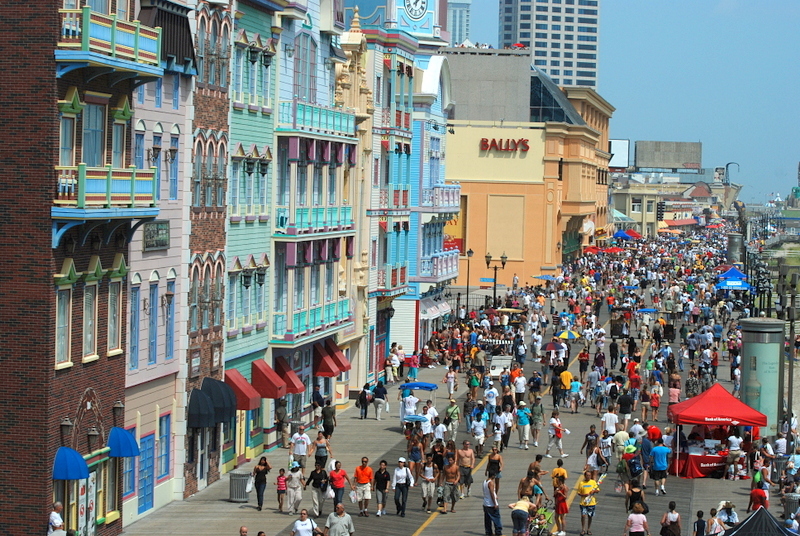 As tourism declined during the 1940s and 1950s and people were drawn to new destinations such as Las Vegas and Disneyland, local leaders sought new ways to bring people back to Atlantic City. The solution was to legalize gambling in competition with Las Vegas, then the only U.S. city to allow gambling. 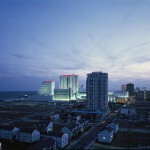 In 1976, New Jersey legalized gambling and the first casino opened in Atlantic City in 1978. Ten years later over a dozen casinos were operating within the city. For a time casinos brought the languishing Boardwalk back to life, but by the second decade of the twenty-first century the city’s fortunes had faltered again. In 2014, four casinos closed, all located on the Boardwalk. Bally’s Atlantic City Hotel & Casino, which includes the colorful tiers here, was one of the properties still in business in 2015. The thick crowd on the Boardwalk on the day this photo was taken in August 2009 was largely due to an airshow that drew hundreds of thousands of people to the all-day event. 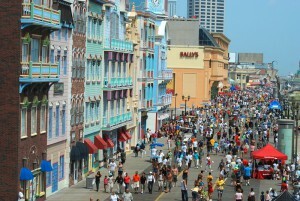 As Atlantic City’s hold on East Coast gambling gave way to competition from new casinos in Pennsylvania and elsewhere, the city hoped to expand its reputation, drawing visitors with events and other entertainment. Posted by Don Groff on February 27, 2015 at 9:38 am. Bookmark the permalink. Follow any comments here with the RSS feed for this post. Post a comment or leave a trackback: Trackback URL.